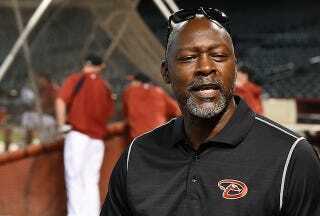 When the Arizona Diamondbacks cleaned house in the offseason, firing manager Kirk "The Grit Lord" Gibson and GM Kevin Towers, the schadenfreude-inclined baseball fan may have feared that the team's new regime would do away with the team's retrograde ethos—the one that made them think trading Justin Upton was a good idea, and that all one needs to win a division is a legion of scrappy slap hitters. Well, fear not! I think James is a throwback guy by the way he goes about his business and the innings he pitches," Stewart said. "I think the fact that Tony (La Russa) is here and that we have more baseball people – he probably sees us as a true baseball team vs. some of the other teams out here that are geared more toward analytics and those type of things. Should be another fun season in Arizona!